Painting of Azerbaijani artist Maryam Alakbarli was awarded at the autumn exhibition of Beaux-Arts society in Boulogne-Billancourt commune of Paris. Maryam Alakbarli `s work "Rosemary Beach" was named the best work on exhibition, Report.Az informs. Young artist created the painting of non-standard size (250/180). With high skills and improvisation of live colors she reflected the beautiful view on canvas. More than 50 artists, sculptors and photographs introduced their works to the exhibition dedicated to nature. The exhibition will end on November 22. Beaux-Arts society was established in 1934 by famous French sculptor and artist, author of a number bronze monuments Marcel Looy. 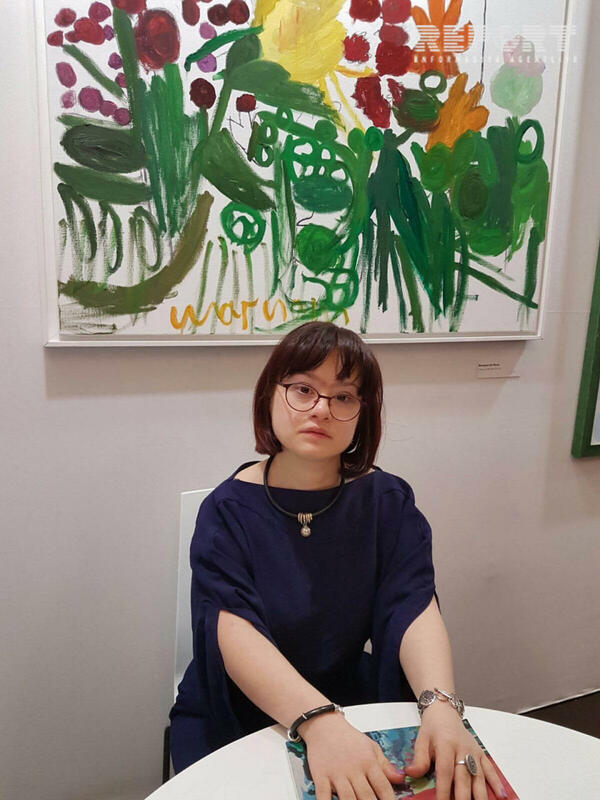 Born in 1991, Alakbarli, whoe suffers from Down's syndrome,developed a taste for painting and sculpting at a very early age. The artist chooses colors masterly. The inherent feeling of color distinguishes her art. She puts much sincerity, harmony and goodness into her paintings. Artist's works have earned big success both in her motherland Azerbaijan and beyond its borders including Germany, Italy, Russia, Turkey Lithuania and France. While suffering from Down's syndrome, lists of her work which mainly characterize educational themes are representative of her zeal and creativity. Sensing deeply the real world with its problems, Maryam heartily incarnates her works with the warmness of her heart, her subtle perception of reality, although not appreciated in the way she warrants, the young artist shows all the beauty of the world by dints of the language of colors and brush. Once, Juliette Binoche, world famous French actress, said, "Maryam has her own vision on the color combination.She shares her feeling of being impressed on the creativity of the young artist by stating that Rose-red, yellow and brown tint, bright green, bloody red, black as antimony - she boldly works with these colors, like the nature creating the bright and harmonious world." Earlier in 2013, "Colours of the Soul", a catalogue which features paintings of Maryam including her approval and appraisal by other artists, came out. The colorfully illustrated catalogue, which was printed by the publishing house Sharq-Qarb, has published a complete series of the talented painter's light work.